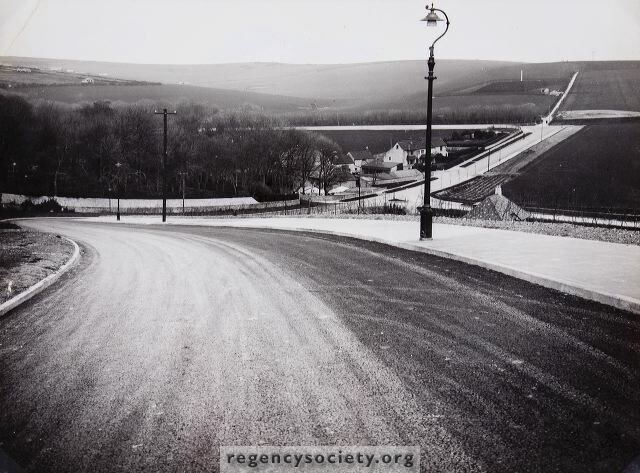 A particularly fine photograph looking down Ovingdean Road, past the farm buildings to a completely empty Falmer Road, with far left a glimpse of the isolated shacks, bungalows etc. put up by the original settlers of Woodingdean in 1920s. From this one can see how much land these pioneers got for their modest investment. I do not know when this photograph was taken. By the newness of everything, roads, trees, pavement etc. my guess would be the mid-1930s, but it could be ten years later, soon after the end of the Second World War. No sign of Longhill School though.